Jackie in the driver's seat! I photo shopped and brightened the image. Anyone know what that solid tired vehicle is? Looks like a rear view of a hotel hack. #2969 was assigned to the 100 Street Depot and to route 18, 86th Street Crosstown! 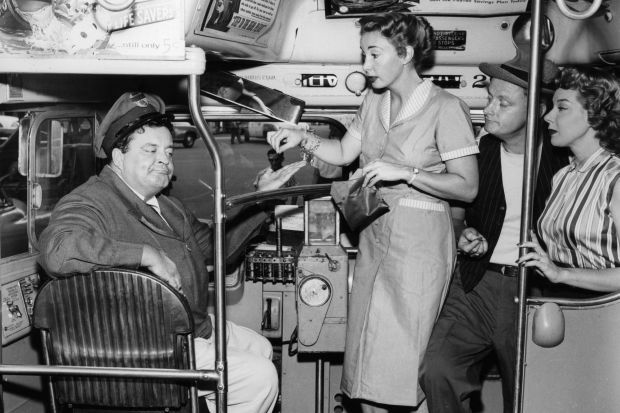 The Honeymooners did not debut till 1955. Therefore, am sure 2969 was reassigned to route 1/2 Madison Avenue out of the same depot. 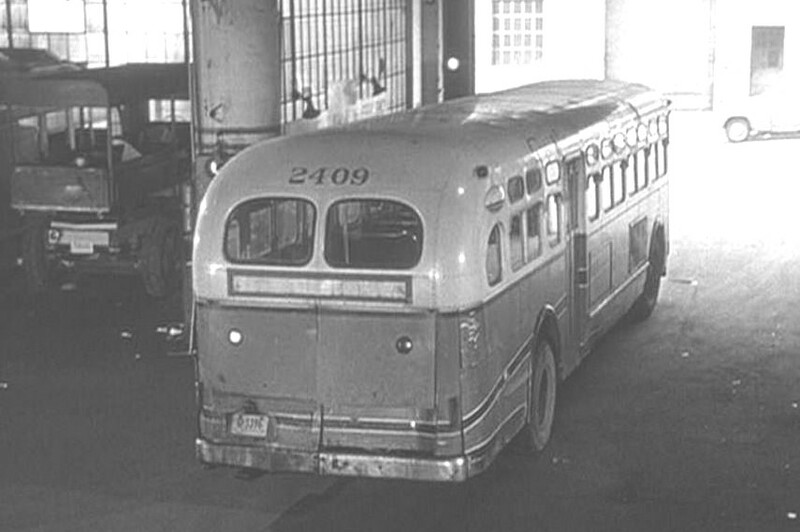 The route 2A -Fifth-Madison & Seventh Ave was now operating out of the 146 Street Depot. - The pictures of Gleason and his co-stars inside 2969 were apparently taken on Aug. 22, 1955. The bus was parked right outside the Park Sheraton (Gleason's base at the time) on 56th Street just west of Seventh Avenue. The 101A first went into service March 2, 1969, as: a) a replacement/rerouting of the 2 - Fifth-Madison & Lenox Avenues line, and b) a de facto revival (albeit with major differences in its route path south of 24th Street) of the old NYCO / FACL - NYCO Division 4 - Lexington & Lenox Avenues line that ran from 1936 to 1960. 2d Avenue - was that the depot that later passed to the TA for their Manhattan Division? 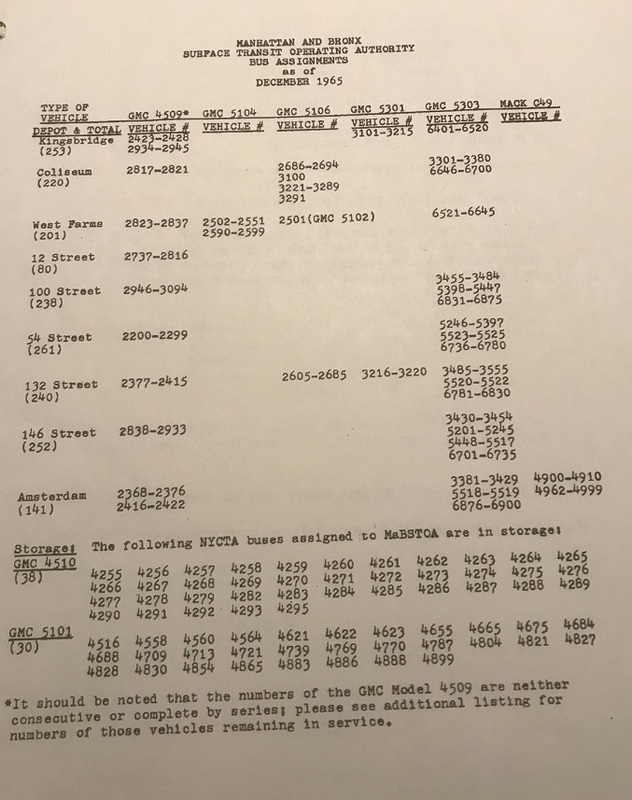 In any case, this explains why some routes wouldn't get New Looks until after the 1963, '64, '65 and '66 orders; and that as of that 1962 date, only six of the depots had the "new kids on the block." I'm curious as to the original depot assignments of the first batch of buses (3301-3555 in the 5303 configuration) ordered and built for MaBSTOA in 1963. I know a lot went to Bronx depots to enable a mass scrapping of the most dilapidated of the Surface fleet; but a few I venture made their way to Manhattan "at the time" (such as Rts. 106 42d St. Crosstown and 104 Broadway). Didn't a few hold down some Fifth Avenue routes (i.e. assigned out of 132 St) in the last few months before the September 1963 closure of Washington Square to bus traffic? Posted below is the MaBSTOA bus assignments by depot, fleet numbers, and models. The routes assigned to the depots is also noted. The listing appeared in the 1972 issue of Motor Coach Age dealing with MaBSTOA's first 10 years. The date of the listing is as of February 1970. Thank you for posting the interesting information. Aha. 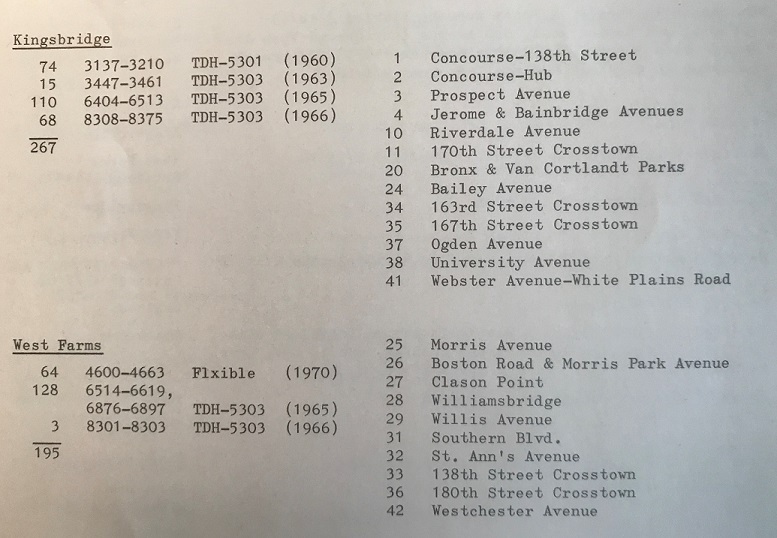 So theoretically, 1963 TDH-5303 buses within the 3485-3555 range would have been the ones traipsing through Washington Square Park in the 2 or so months prior to the September 1963 closure thereof to all bus traffic (we know 3 and 5 were/are assigned out of 132nd Street; but what would 2/2A/M2 have come out of then?). Interesting to see how some of them were moved (and what older buses were retired) between the December 1965 and February 1970 timelines. But it does open a window (ha ha) as to what came from where, in terms of figuring out pics taken in those days. As well, what would have been the code for the 12th Street depot on the Johnson/Keene (or Grant or whatever) fare boxes? I know from OTS and OFS and OHS and FFS and AMS and such, plus the subsequent HUD for Hudson Pier . . .
12 Street Depot, perhaps "TWS"??? BTW, MaBSTOA never had Grant fareboxes. They had Johnson (later Keene) models "D" (motorized coffee grinders) and K-25, first with a return coin drawer, then safety vault (exact fares) and finally vacumn bases still used today. I was thinking either 'TWS' or 'TS'. But now that you mention it, Johnson/Keene was ubiquitous on MaBSTOA bus rolling stock. Grants were used by Triboro and Green Bus. Not sure about Jamaica Buses but I think they also had Grants. When they went to exact fare I remember Triboro put what appeared to be a homebuilt vaults under the Grants and had the coin changer blocked out. Then they switched to K25 with vaults. Weird to see Triboro using Keene boxes. I think Green also did the same. Steinway and Queens Transit used Main fare boxes. 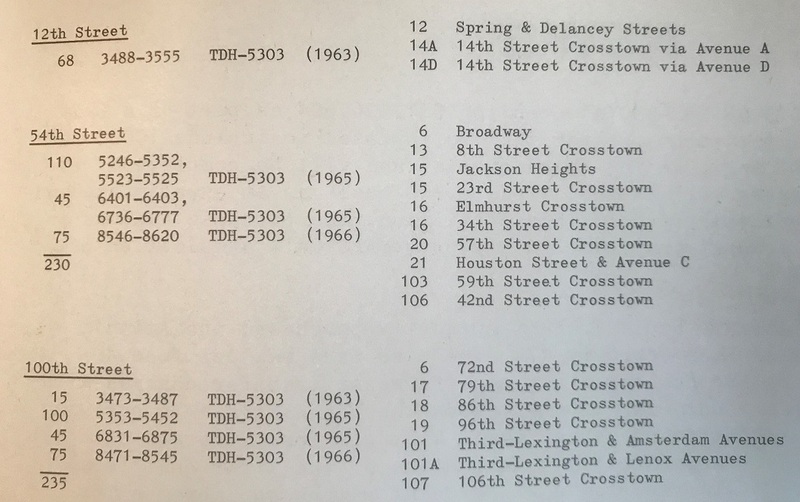 Fifth Avenue and Surface had on their TDH 5301s/TDH 5106s and Mack C-49s Grants. - Since the "Jackie Gleason bus," 2969, and its brethren were still active at 'OHS' alongside the Newer Look kids on the block - and especially given how that depot's allotment of the batwinged 1965 order (6831-6875) was already on the property - I presume the 4509's in question remained up to the 1967 delivery of the A/C batwings (of which 100th was allotted 8471-8545), then were retired and subsequently scrapped. 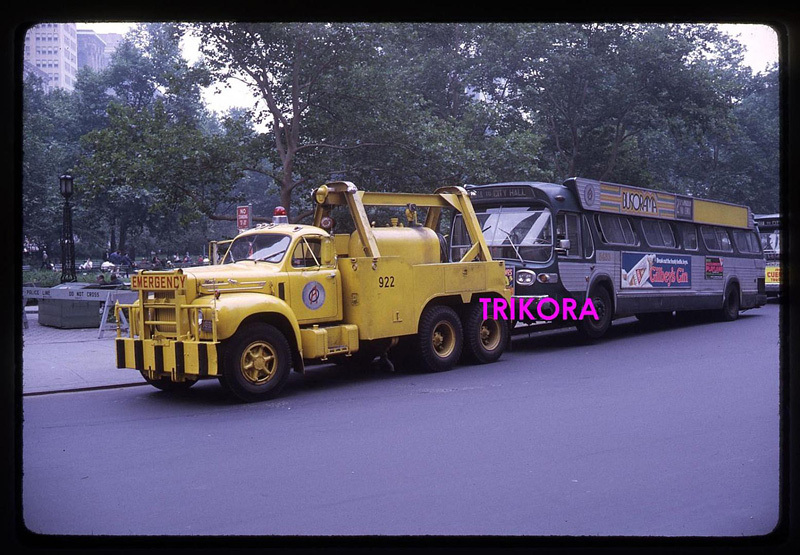 - Below shows early on in the existence of 101A, around City Hall, one of the A/C batwings (#8483, from 100th Street) on a 101A run, being towed from City Hall by a MaBSTOA tow truck - yet on the side, '2 - 5th & Madison via Lenox' which shows just how that earlier route had been transmogrified.